Superman Family Adventures follows our favorite Kryptonian and his adventures with Lois, Jimmy, Supergirl and many others (including Fuzzy the Krypto Mouse). Just like Tiny Titans , this series is already a hit with comic book fans of all ages. Issue #2 was released this week and if you haven’t picked it up at your local comic book store or downloaded it from Comixology, I would highly suggest you give it a try. 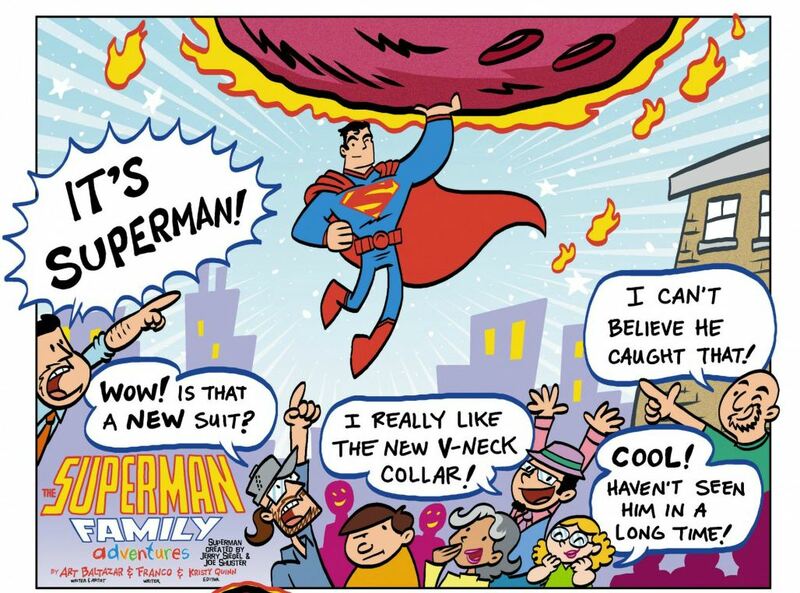 Recently, I was given the chance to interview one of the men behind DC Comics newest children’s series, Superman Family Adventures artist Art Baltazar. GeekMom: How long does it take to write one issue? AB: It seems like it takes me about three weeks to do a book. It’s a little longer than it took for Tiny Titans, because there is alot more story and more awesomeness. GM: What’s the process from idea to print? AB: I write all of my ideas in a sketchbook and me and Franco talk about all the stories over the phone. He talks while I’m drawing and when we are done we get it together. The thought process is just to make fun and awesome comics that are funny and have action. I like to write comics that are like what I enjoyed when I was a little kid. GM: Do you have any plans to have it published digitally? GM: Are there any plans for Lois Lane? AB: Yea. I think so. She is going to be a major counter point to Clark. There are going to be many moments where she might think she knows who he is, but he’s going to try and trick her. GM: Will any of the supporting cast get spotlights? AB: Ohh yea. Issue three is Jimmy Olsen. Every issue is pretty much a different guy. Everyone in the whole family will get their spotlight at some point. Jeffery: Will Ma and Pa Kent be around? AB: Yea we will see them as well as Jor-El. You will probably see more of Ma Kent than the other two though. Jeffery: Will Lana Lang be hanging around too? I’d love to see your take on Insect Queen! Buzzzzz! AB: Lana will be showing up pretty soon. We have a whole bunch of stories written and she is in there. We are also going to have a little lover triangle between Lana, Lois, Clark and one more girl <top secret>. Jeffery: Will Jimmy Olsen surprise us with lots of disguises and transformations? AB: Yes. He gets stretchy for a while. He also has a Superman wrist watch that gets him in a lot of trouble too. Jeffery: What does Superman feed Krypto? AB: He’s a dog who eats regular food. He’s just…super. AB: Yea. He’s going to be in issue #5, but he’s going to become somebody, but that’s a surprise too. AB: Ohh yea. I look at my kids all the time for stories. I have a 6 year old daughter and an 8 year old son. My daughter tells me a lot of what she wants to see, so I listen to her a lot. Most of it is based on what I know. AB: Ohh yea. Bizzaro shows up in issue 2 and we will see a whole bunch of characters in issue 12 that will take care of a whole bunch of characters. Just like in Tiny Titans , you never know where you are going to end. AB: Superman has always been my favorite DC Comics Character. I grew up with Superman and it seemed the natural thing to do to go from Tiny Titans to Superman. I never really thought about the Incredibles when putting this together. AB: Yea. I made the costumes the same as the new 52 because he is the new and latest version of Superman. I’m a big Fan of DC Comics. THANK YOU for reading and wanting to read about Superman. It’s really special for me to make a brand new comic book readers.